Unless you’re living under a rock, you already know last night was the final episode of David Letterman’s 33-year late-night comedy run. Closer to home, we read that in the Frugalwoods frugality-themed blog. This couple forgets about the rat race. Who needs to keep up when you’re happier marching to your drumbeat? …okay, mom said there’s nothing “inner” about our dork, but we’ll ignore that. Letterman’s show was strange. I remember the first time I watched it. He was gangly, tall and awkward. He had crazy hair and bucked teeth. I had no idea what to think. Then I realized something cool. David Letterman didn’t care about that…he was crafting his best quirky show. It may be subtle, but this is a different point than “keeping up with the Joneses.” Trying to impress people constantly will bury you and your checkbook. Embracing your dork will make you millions of dollars (and happy). Elon Musk spends his days asking questions that most of us don’t think about because he’s trained himself. Tim Ferris is a human guinea pig. How about you? Our BIG Challenge: What is your brand of dorkiness? What makes you unique? Are you exploring how that uniqueness can earn you more money? The only thing you knew to expect from the Letterman show was that there were going to be surprises. How interesting is life when there are unexpected plot twists? Most people say they don’t like surprises, and yet we gladly tuned in to see what the next stunt would be (watermelons off the roof, jumping up a velcro wall or a discussion with the business owners next door….). Back when I was an advisor, I saw investors atrophy into a hodgepodge of investments and financial habits just because that’s what they’d always done. Mix it up. If you’re paying off debt, explore apps to help you stay motivated (we like ReadyForZero, for example). When budgeting try reading about saving half your income for inspiration (Kathleen’s tackled this on our Frugal Portland blog). Participate in Cait Flanders‘s spending freeze or Canadian Budget Binder’s grocery challenge. Make your life interesting by adding texture. Our BIG Challenge: Mix it up! Find good podcasts! Read good blogs. Find free apps to help you better track your spending, your debt or your portfolio. You can’t think of David Letterman without thinking of his incredible bandleader, Paul Shaffer, his announcer Alan Kalter, Larry (Bud) Melman, and many of the musicians, comedians, and support staff that made the show. I think Letterman’s show became a little stale the last few years when he seemed to follow the Leno playbook more closely and abandoned some of his more quirky stunts and strange characters. Studies have shown that you are the sum of the five people you spend the most time with, so take a page out of Letterman’s book and surround yourself with awesome people. They’ll lift you up in ways you won’t understand until you’re there. If you want wealth, spend time with wealthy people. Hoping to get out of debt? Stop hanging out with people who spend lots of money on random stuff and instead meet up with people who’ve already done it. Not only do they know the secrets to doing it right, but they’ll motivate you. Five years ago, I’d never run a marathon. Now I’ve run ten, and I’ve run every day for nearly three years. Why? My friends are all distance runners. It isn’t an accident. Our BIG Challenge: Find someone who IS the person you’re trying to become. Invite them out for coffee. Get to know them. You don’t need to reinvent the wheel. Letterman sought unknown comics and bands and elevated them to the limelight. Norm McDonald cried at the end of his final Letterman set. My favorite bands, Kathleen Edwards and The BoDeans both took to Facebook to tell them how grateful they were for the attention. Howard Stern paused on his Sirius Satellite show Thursday to publicly say how much it meant to have David Letterman ask him on the show when most people wouldn’t touch him or his career. David helped lots of people….and was a monster success. Motivational speaker Zig Ziglar said that the best method to get what you want was to help lots of other people get what they want. Need more money? Find ways to help others….money will come. Some people say that this whole idea of Napoleon Hill‘s “law of attraction,” is a bunch of baloney. Maybe. I’ll say this, though. Some of the happiest and most successful people I ever met in my career managing money were also the biggest givers. Whether it is giving to charities or just mentoring others, it didn’t matter. Success with money follows people who find a way to help other people find the limelight. Our BIG Challenge: Who do you know that could use your help (and deserves it)? What are you waiting for? Jump into the trenches. You won’t regret it. David Letterman has had his share of struggles in his very public career, but the one thing he showed us is that laughter really is the best coping mechanism. Even on his last show, he avoided tears by focusing on the positives…all of the fun episodes and amazing moments he helped create. I remember the year I made no money and creditors were all over me. One day, Cheryl and I just started laughing for no reason. The stress was overwhelming. We’d tapped all of our relatives for money. We were in debt so far that there seemed to be no way out…and we were laughing. Man, did that help. We kept attacking, but by recognizing your humanity and not taking yourself so seriously….you’re a step closer to calmly facing your fears and moving forward. Our BIG Challenge: What’s funny about your day today? The next time you’re down on yourself, sit back and find the humor. It’s there….you just need to look for it. Some of the ideas Letterman explored shouldn’t have ever worked. Stupid pet tricks? Better yet….stupid human tricks? Bringing on characters who clearly had some mental issues to make your audience laugh? You can question some of the ethics of Letterman’s decisions (someone today said that David Letterman made the world “a meaner place.” True? I don’t know, but it’s debatable), but it’s impossible to see that his gut instinct worked. His long list of Emmys is proof that people were buying Dave’s brand of late night television. When it comes to your personal financial picture, often you know what the issue is…but you don’t move. Why? It feels easier to do nothing. Maybe you need to spend less money. Maybe you need to do more research online about that mutual fund before you buy it….whatever the situation, take action! Anthony Robbins says that top performers succeed because they make big, life changing decisions at a faster pace than average people. They are right more often….they just move more quickly. Dave’s biggest job was to ask questions. Guests would sit in the chair across from his desk and he’d ask questions. A huge part of Dave’s success was asking questions in a way that got his guests to open up. He successfully asked Oprah Winfrey to come on so many times that she finally did……because he just kept asking. We could have written “be persistent” here (and maybe that’s #11 on this list…. ), but the bigger point is to question everything, and to do it in a way that’s different than most. Start off with the straightforward question: how do I achieve that goal? Then ask deeper questions, “What are some ways I can achieve that more quickly?” Maybe in the past you’d thought you’d find bargains, but you’d never thought about buying used. Better yet, you found it for free just because you looked differently (like Jake at iHeartBudgets found his $2,000 fridge and fixed it for $14. Bam!). Question. Everything. Our BIG Challenge: Think about your budget. How could you eliminate $100 from your monthly budget right now. Can’t? What’s a way you could earn an extra $100 each month? Just putting that question in your head now has your brain pumping, doesn’t it? I’m always frustrated when the world has presented a brick wall to a friend or colleague and they can’t seem to get around it. All of us friends are even pointing at the many (sometime obvious) alternate routes to success…but they don’t move because they’re so stuck on the brick wall. Contingency planning is a huge part of an effective financial plan. From a decent emergency fund to the right insurances, it’s important to think “what if” and put safeguards in place. Our BIG Challenge: What could happen to you? What if you had a car wreck tomorrow? Where would your income come from? How would you deal with the auto? …the hospital? …who would take care of your kids if you were unable? Ask your self these big questions early, write down and share your answers…buy insurance….create an emergency fund….whatever it takes. THEN never think about your contingency plan again until something bad happens. Planning frees you from worrying about the bad stuff instead of focusing on your job, family and life. 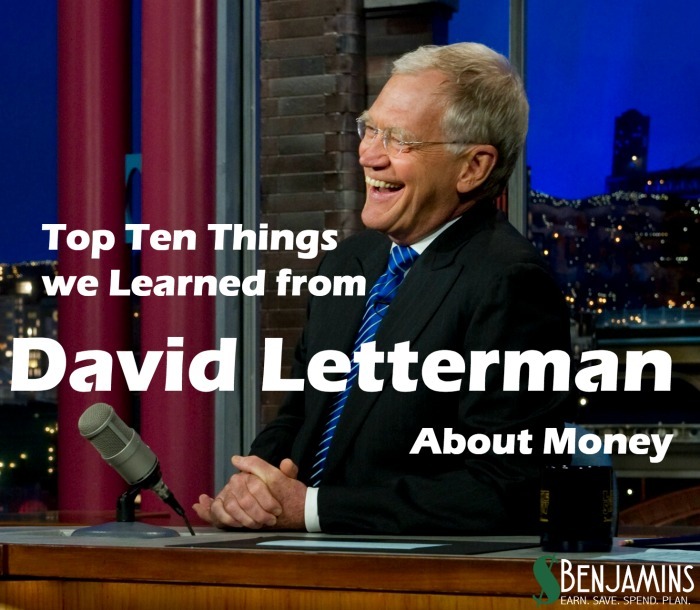 ….and the #1 “thing” David Letterman’s show taught us about money….. Early in his career, David Letterman adapted. No just with the CBS move, his heart surgery, his unfortunate incident with a staff member…..but even during his shows when a guest would make unexpected comments. Later in his career, after Jay Leno retired, Letterman admitted that he didn’t want to do the types of stunts Jimmy Fallon and Jimmy Kimmel were doing on their shows. He’d gone from the adaptable mover to a guy who decided not to adapt….and retired. There isn’t anything wrong with a huge successful retirement. Hopefully one day we’d all love to have a string of people telling us how lucky we were and how much they enjoyed working with us for 33 years…..that’s amazing (especially in television!). …but if you can’t adapt it’s time to go, and sadly, I think we’d all admit that you’re seeing viral videos from the Jimmies but not from Dave much. It was time to go. An important book about adapting is Who Moved My Cheese. In it, rats in a maze always run every day to the same spot, where researchers had placed cheese. One day they raced to the spot and no cheese was there. Some mice cried about it. Others couldn’t cope. However, you know what the winners did. They adapted. It was time to look for new cheese. Successful money management is about adaptation. Banking is changing. Investments are changing. The rules are always morphing. You need to adapt as well if you’re going to be successful with your money. Our BIG Challenge: What’s the biggest area where you need to adapt in your career or with your money management where you know you’ve been resisting? Schedule a time to begin making changes in that area of your life. Watch videos….read….whatever it takes to get comfortable enough to make the moves you’ll need to stay successful. Thanks for the mention. I really need to work on the investing side of our finances. I’ve been saying it forever but something always keeps popping up, new job, baby etc. I’d like to work on that. Great list! Thank you so much for including me–I really appreciate it! I too am a big fan of planning for contingencies. It’s one of the things that really motivates my frugality. I think that when you’re not living paycheck-to-paycheck, you suddenly have so many more options in life.